Johana"- Little Kyoto" SUBPAGE | All Japan Kyoto Association"
Johana is a region with approx. 9,000 people belonging to Nanto City and is located on the southern end of the Tonami Plain in the southwestern part of Toyama Prefecture. The town was developed in the neighborhood of Zentoku-ji Temple which was relocated from the nearby Fukumitsu town in the late Muromachi period. 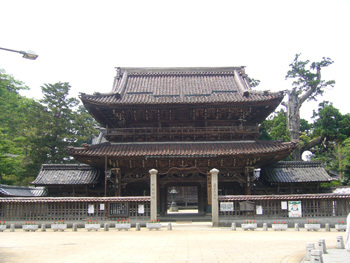 The town became more prosperous during the Edo period under the governance of the Maeda Family who ruled Kaga Province. Silk production helped in the development of the town significantly since it is located at the foot of Mt. Gokayama (World Heritage), the famous silk production area. Exhibition about the town’s most historical festival with a 300-year history is open throughout the year. The massive temple building impresses people with the dignity of its 500-year history. Some 50,000 beautiful white Asian skunk cabbages bloom all around the pond in May. Visitors can learn about and enjoy silk weaving, an important traditional industry of the town. Original silk items are available in the shop along with the silk weaving experience studio. An artificial lake with an approx. 3-km circumference. Surrounded by beautiful nature, the park hosts many leisure facilities such as playing equipment, a skating park, a barbeque house and camp site. A multi-purpose community house whose architectural design incorporates a traditional machiya townhouse of Johana and theatre. Traditional Mugiya Dance and Iori Songs are performed regularly. The last day of February is the time when merchants from Johana Town and the people from the mountains conducted business around Mt. Gokayama. A market is opened on the day based on this old tradition. The Hikiyama Festival is an annual spring festival dedicated to Johana Shinmei-gu Shrine. It is designated as an Intangible Cultural Heritage of Japan and was designated as the Intangible World Heritage by UNESCO in December 2017. The festival, which includes a Chinese lion dance and a procession of large floats, has been taking place for 300 years. 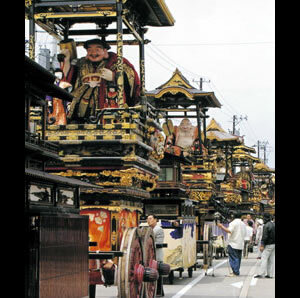 Especially noteworthy are the floats called Iori Yatai which people from the town’s six regions pull around the town by themselves. A float is six meters high and 7 tons. Participants sit on the float playing music with shamisen (three-string Japanese guitar), whistle and drums along with the singing of Iori-uta songs. Iori-uta is a traditional song whose origin comes from Edo (present-day Tokyo) and Kyoto. Lanterns that are lit in the evening greatly enhance the festive mood. More than 1,000 important temple treasures and valuable historical articles belonging to the Kaga Maeda Family are dried in the sun. The somewhat sad song’s tunes and energetic dance will impress the audiences’ heart. An event in which people can enjoy and experience tradition, culture, food, nature and the people of Johana. Also known as white lacquer makie, the makie lacquer decoration of Johana is extremely beautiful and sophisticated. Silk items of Johana are the proud result of a 400-year history. Kaya-yaki is a simple, crispy cracker made solely from Japanese nutmeg seeds, flour and sugar. Using a kind of persimmon called Sanja-gaki, dried persimmons from Johana are very popular as a gift for someone special from the end of December to the New Year’s-time. Carefully grilled with charcoal fire, loaches are light and tasty. Locally grown turnips and mackerel are fermented in koji rice malt and become a perfect sushi combination for winter.